Over fifty local residents, friends, volunteers and community partners joined together Saturday 20th October for a 5K & 1K Fun Run, walk, jog in The Duchess of Hamilton Park. This Fun Event organised with the support of Holy Trinity Mothers’ Union provided opportunity for increasing physical activity and joining in all age activity in the community. North Lanarkshire Active Schools from the Community Sports Hub at Dalzell High, and Voluntary Action North Lanarkshire partnered with Holy Trinity Church giving advice, support and equipment and recruited volunteer stewards. John Brown DL; CEO of Lifeskills Centres kindly sponsored the water for participants. 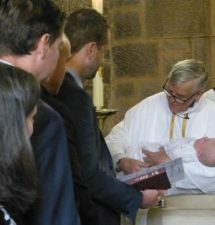 First Aid duties were covered by St. Andrew’s Ambulance Scotland. Grant funding to cover costs of medals and administration was provided by a Community Grant from North Lanarkshire Council. Katharine Kilgour the Branch leader of the Mothers’ Union at Holy Trinity praised her team of branch members, church and local people saying she was ‘delighted to see all ages and abilities join in the fun and the response was terrific from across the community’. The first event of it’s kind utilised the path network in the Duchess Park to complete 1K and 5K events with people invited to run, jog or walk at their own pace. 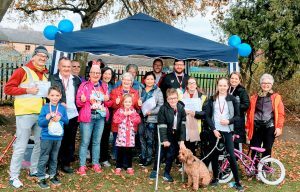 Ages from 6 to 80 with parents and children and grandparents took up the challenge and everyone completing the course received a medal and a gift pedometer provided by Mothers’ Union central HQ in London. 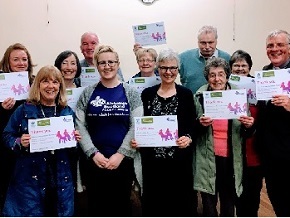 Volunteers from Voluntary Action North Lanarkshire were recruited and coordinated by Kirsty Struthers to assist with welcoming, registration, stewarding and encouraging participants for their events. Councillors Meghan Gallacher and Paul Kelly and Agy McGowan joined in with taking up the 5K challenge and each were involved in starting races, and presenting prizes and certificates.